We are gradually introducing eBook versions of our pilot guides. These offer the same quality and carefully-checked content of our printed pilot guides, but you can load several onto your phone, tablet or laptop at once to save space in your luggage. 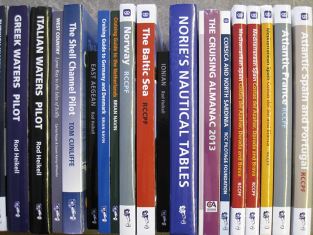 Imray pilots can be purchased as ePub files from digital book stores such as iBooks and Google Play books. They can be read on a wide range of smartphones, tablets and desktop computers including PC, Mac, iPad, iPhone, Android, Nook, Sony Reader etc. They are not currently supported for Kindle. To buy your Imray ePub, go directly to the digital book store (iBooks, Google Play, etc). Search by book title. Most book stores offer an option to preview before you buy. Greek Waters Pilot (twelfth edition).